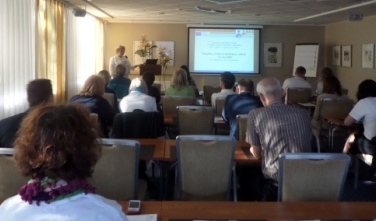 On September 18th 2014, the national seminar of the project Trans e-facilitator was organised in Latvia by the project partner LIKTA. Stakeholders form Ministry of Welfare, State Employment agency, Ministry of Regional Development, State Culture Information systems as well as Education and training coordinators and senior experts from 12 regional municipalities took part in the seminar. The main goal of the seminar was to introduce participants to training methodology, online training platform and materials, as well as project piloting results in Latvia. LIKTA vice-president Mara Jakobsone introduced audience with the project overall goals and outputs, as well about how the project results can be shared. Latvian "supertrainers" presented the piloting results and explained in details the module content and training path. A live discussion was raised about the benefits and challenges of e-learning. At the end of the seminar different networks (teachers, Librarians, State employment agency consultants) expressed interest to join the Trans e-facilitator online platform for trainings.